Thread: The picture of this steamer says it all! Warning, Veiwing photo may cause immediate and unsatiable demand for this locomotive! I know the PRR S-1 would go great on the Conrail Indy route, even though she may be "out of place"! She is one of my all time favorites, and I'd love to get her pounding down the track at 120mph, if even for just one time! RE: The picture of this steamer says it all! The terms you mentioned don't even begin to cover the factor. You might want to have posted WARNING: Viewing of the photos contained herein may cause the following side effects: Uncontrollable drolling, excessive demand for Pennsy steamers, and consistent dreaming of models of pictured items. If you have any of these symptoms, please visit your local BLLW oficial right away. Now back to the serious side. I know some of the history here. 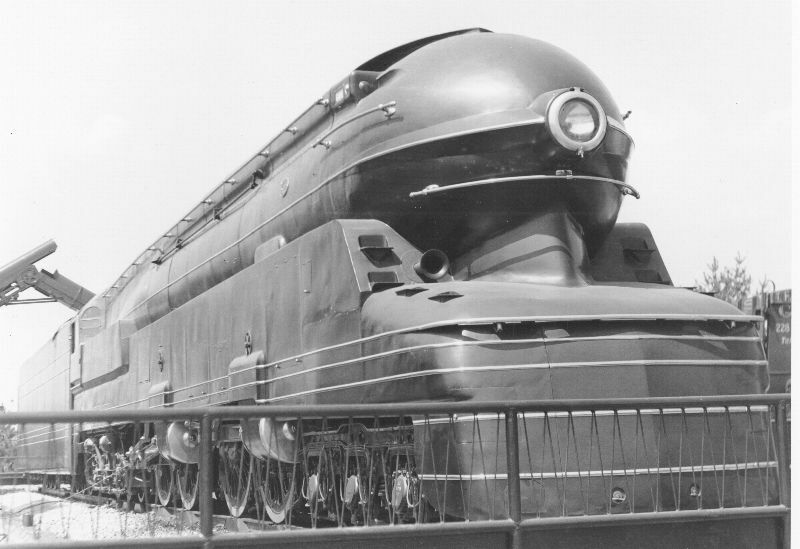 The model shown, the PRR's own experimental S-1 Duplex, was designed and built by the Altoona Works with styling designed by Industrial designer Raymond Loewy. The only problem with the unit was that despite the weight restrictions they gave to the builders, it exceeded these, requriing the two six-axle trucks to attempt to lighten the load factor on the railheads. Picture 1 and three show the unit on Display at the World's Fair I believe, where it was positioned on rollers to allow it to be operated for the crowds to view. Picture two shows it after the removal of some of her skirting in the early 50's to allow easier access to important mechanical parts. Notice the cover over the drop coupler and the valve gear removed. Technically, it would work right on Conrail Indy, as the units during their lives were based out of Crestline, Ohio and ran as far as Cleveland ( the PRR's Midwest Racetrack ) Almost all the duplexes and even the S-2 Steam turnbine were based here until their retirement and ultimately met their end here as well. If you live near that area, the roundhouse is still there, slowly deteriorating and slowly following the fate of the engines it once housed. The last pic shows the S-1 in revenue service, probably sometime in the late 40's,as the engine is still fully shrouded.